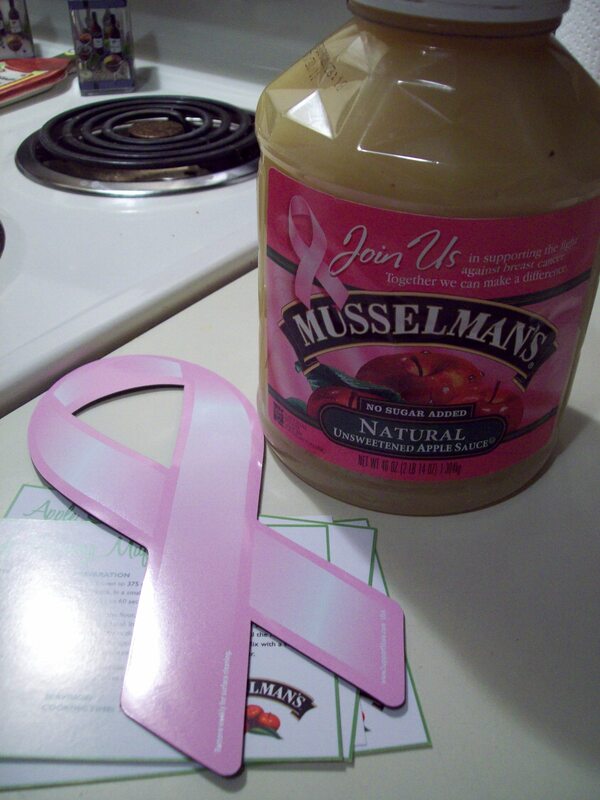 During the month of January, Musselman’s is teaming up with the National Breast Cancer Foundation, donating ten cents to the cause for every package of Musselman’s Natural Apple Sauce purchased! We all know how important a cause this is, but it immediately reminds me of two very special people in my own life. My future mother-in-law (at the time) had recently had surgery for Stage III breast cancer when she passed away unexpectedly, just six weeks shy of our wedding. The second is a very special lady that I “met” through the amazing blogosphere! Erica‘s story is one of the most amazing and inspiring that I have ever had the privledge to witness. Her story is one of faith, courage and survival. She’s a beautiful lady both inside and out. Check out the Musselman’s site for more information! In order to promote this campaign, I was sent a container of the Natural Apple Sauce (which is the best to me) along with some fun recipe cards and a nice pink breast cancer ribbon magnet that I promptly put on my fridge! Natural applesauce is a good staple to have on hand for recipes or just as part of your everyday eats. I love using it in recipes, just like I did with my applesauce oats yesterday morning, in most baked goods (in place of oils or eggs) and also in pancakes. I am also going to make the Good Morning Muffins recipe from the card above (only substituting flax for the egg) and I’m sure I will come up with even more ways to enjoy it soon! Please tell your friends and go out and buy some Musselman’s natural apple sauce to support this amazing cause! 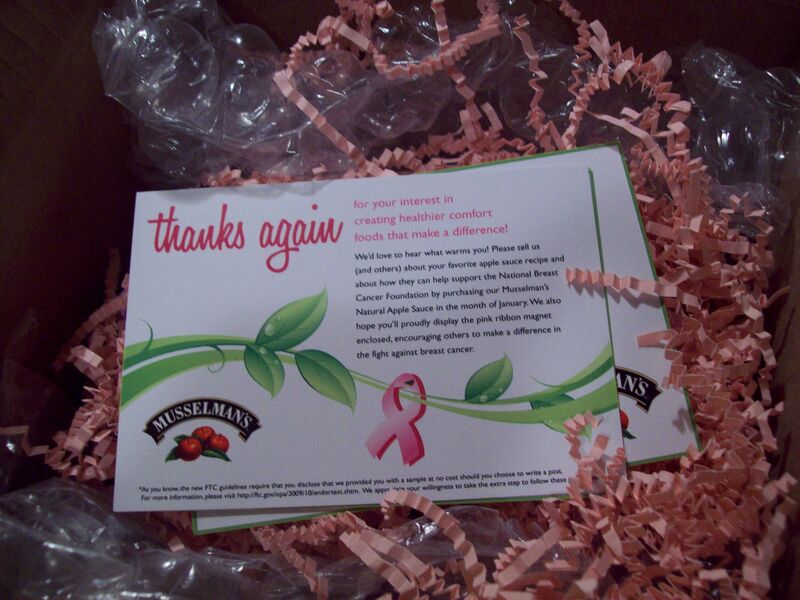 Musselman’s has offered to send one of you the same package you see above: the applesauce, recipe cards and pink ribbon magnet. Just leave a comment on this post by 11:59 p.m. (EST) on Sunday, January 10th. Feel free to leave a memory of a loved one or another personal connection to breast cancer. You can also receive extra entries by linking this on Twitter or your own blog, just leave another comment here to tell me you did so. Posted on January 7, 2010, in Uncategorized and tagged breast cancer, giveaway, Musselman's, NBCF. Bookmark the permalink. 13 Comments. Awwww, girl…;-) You are the SWEETEST thing ever! That’s the greatest shout out I’ve ever received! Thank you for your friendship and for getting the word out to support this wonderful cause. Love ya too!!! 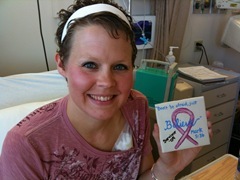 My 38 year old cousin recently got diagnosed with breast cancer so it is definitely hitting close to home right now. I don’t have a personal connection to breast cancer, but I do what I can to help the cause — especially in October. I love Musselman’s applesauces 🙂 *Thanks* for the giveaway! I think what Mussleman is doing is wonderful. That applesauce looks delicious. Applesauce is a healthy and delicious substitute for oil in muffin recipes! Ahh I love mussleman’s applesauce! I would love to win this giveaway. (: Thanks girl!! My aunt was recently diagnosed with breast cancer. I always thought breast cancer was one of “those things” that happened to “other people”, but now it really hits close to home. We love applesauce around here…with two kids (and me!!) it never lasts long!! My grandmother is a breast cancer survivor and she is a hug inspiration. She’s 85 years old now she is so young at heart and full of life its hard ot imagine she went through something like that. Ps. I love applesauce …on everything :). I use it in alll my baking to replace oil and eggs. It works like a charm!